Is Nancy Pelosi The New Queen Of Mean? | Virginia Right! 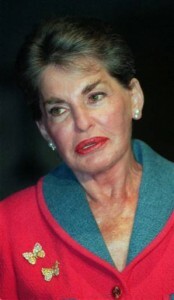 Well, Leona Helmsley has been dead for nearly two years and the new “Queen of Mean” has not been crowned. I would like to nominate Nancy Pelosi. Helmsley clearly enjoyed the luxury of the couple’s private fortune, flying the globe in their 100-seat jet with a bedroom suite. The couple’s residences included a nine-room penthouse with a swimming pool overlooking Central Park atop their own Park Lane Hotel; an $8 million estate in Connecticut; a condo in Palm Beach; and a mountaintop hideaway near Phoenix. Enter Nancy Pelosi. Screaming at our Military because she couldn’t get the last minute jet she wanted. Making jets spend thousands of dollars in fuel to save her a few miles driving. Belittling CEO’s who use private jets to attend meetings and then ordering 8 brand new Gulfstreams and Boeings for her and her congressional fund wasters. 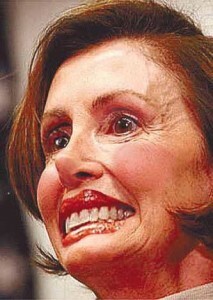 Pelosi calls opposition to her outrageous plan to nationalize Health Care un-American. Like Helmsley, she belittles the “little people” who must suffer under whatever patchwork, hodgepodge scheme that her party puts together. We have seen the results of the “stimulus” plan. Payback to supporters with no actual help for the economy. Most jobs last only 35 hours. We see what Cap and Tax is going to do to our economy and jobs. And we see the “government knows best” approach to our health care. Private companies must tread lightly when changing health plans because the employees are likely to revolt. In fact, Unions have been on strike of minor changes to their health care. Why does Pelosi see anything fake about the reactions to government takeover of Health Care? She is the perfect replacement as “Queen of Mean”. ← NO STALIN BUST FOR BEDFORD D-DAY MEMORIAL!